McCoy: Spock, remind me to tell you that I'm sick and tired of your logic. Spock: A most illogical attitude. The best part of the original Star Trek series is undoubtedly the great cast chemistry. Let's face it, William Shatner, Leonard Nimoy, or DeForest Kelley don't show a lot of acting chops in these episodes. But put them all together, and the result is an iconic trio that's always great fun to watch in action. The Galileo Seven is an especially memorable first season episode because of the way it stretched the characters and allowed relationships to form (especially between Mr. Spock and Dr. McCoy, everyone's favorite squabbling duo). As The Galileo Seven begins, an Enterprise shuttlecraft with seven crewman (including Spock, Scotty, and Dr. McCoy) has become stranded on an alien planet. The Enterprise, on a mission to deliver urgently needed medical supplies, cannot afford to mount an extensive rescue mission. As Kirk tries to convince Starfleet that he needs to stay near the planet, the team on the surface deals with the less-than-peaceful native creatures. Spock grapples with his logical instincts as he tries bring back as many crewman as possible. The Galileo Seven has all the hallmarks of classic Trek: a generic planet, an unconvincing alien menace, and lots of banter between Spock and McCoy. While it never manages to build much tension (hey, look, a red shirt died! ), it is noteworthy nonetheless for some interesting Spock character development. Here, early in the series, he begins to show signs of a struggle between his human and Vulcan sides. It also ends quite well, with Spock admitting he acted emotionally and the whole bridge crew laughing in his face. Random stuff: Writer Oliver Crawford was inspired by the viewing of the 1939 film Five Came Back. David Gerrold, who wrote The Trouble with Tribbles, called The Galileo Seven a rip-off of the Jimmy Stewart film The Flight of the Phoenix. Often, episodes of Star Trek incorporate other genre elements into the sci-fi setting, stretching the conventions of the genre. Some of these episodes were more successful than others. Court Martial employs many of the conventions of the courtroom thriller, but with a refreshing sci-fi twist. The result is an entertaining episode, but one that suffers from too many problems to enter into the hall of classics. Looks like the end for Kirk! Enterprise Officer Ben Finney (Richard Webb) was taking a reading in one of the ship's ion pods when the vessel passed through an ion storm. Kirk was forced to eject the pod, killing Finney. However, his account of the situation (that he ejected the pod after a red alert had been declared) differs from the recorded computer logs—it shows he ejected while still on yellow. He's brought in for trial, and things look bleak. Meanwhile, the rest of the crew races to discover the reason for the disparity in the two stories. Court Martial is definitely watchable, but it suffers from many of the same problems as a lot of early Trek: too much focus on Kirk, and not enough on the rest of the crew. The plot itself is compelling enough, but it's full of exposition—the passages explaining Kirk's previous involvement with the dead crewman are particularly ponderous and heavy-handed. Still, the ending is quite nice, and the courtroom scenes are unintentionally amusing, with a lot of grandiose talk about "rights of the accused". Random stuff: Sets and props from this episode were reused in The Menagerie, as the two were taped back to back. Kirk, describing the amazing "auditory sensor" on the ship, explains that they can increase its sensitivity by an "order of one to the fourth power," which I guess sounds more impressive that just saying "one." Image Transfer Review: Like the rest of the series, the transfers here are quite good. The image is crisp, with nice strong colors. There is a fair amount of visible grain, and some minor scratches or nicks on the film elements, but overall, the episodes look comparable to any other in the collection. 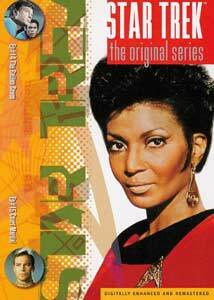 Audio Transfer Review: And again, the sound mix measures up to other Trek releases as well. Nice separation of the elements without sounding too gimmicky. Dialogue is always clear, and sound effects put the main soundstage to good use. Extras Review: Extras are limited to one short, spoiler-packed TV spot for each episode. This disc features Paramount's usual stellar restoration work, just like the rest of the discs in the series. With one solid, entertaining episode, and one that is very important in terms of early character development, this is a worthy addition to a Trek fan's collection.